Who Do You Trust? was an American television game show, originally hosted by comedian Johnny Carson, which aired from 1957 to 1963. The series was initially emceed by Carson and announced by Bill Nimmo. A year into the run, Nimmo was replaced by Ed McMahon. Carson and McMahon departed in 1962 when Carson was hired to take over from Jack Paar on NBC’s Tonight Show. Three married couples competed on each show; the announcer would introduce couples one at a time, and Carson spent more time interviewing the contestants than quizzing them. In the quiz portion, Carson would tell the male contestant the category of the upcoming question; the contestant would then have to decide whether to answer the question himself or “trust” the female contestant. We revisit this “Who do you trust” meme this morning because of what I have been saying the past few weeks. After identifying the selling climax low of December 24, when 48.5% of stocks made new lows, I recorded two 90% upside days (90% of volume and upticks came on the upside). The first one occurred on December 26 and the second on January 3. When such a sequence happens within a two-week period from a selling climax low, it is almost always suggestive that the lows are “in.” That is why I have been adamant since January 4 that the December lows (SPX @ 2346) would not be retested like so many pundits were expecting. 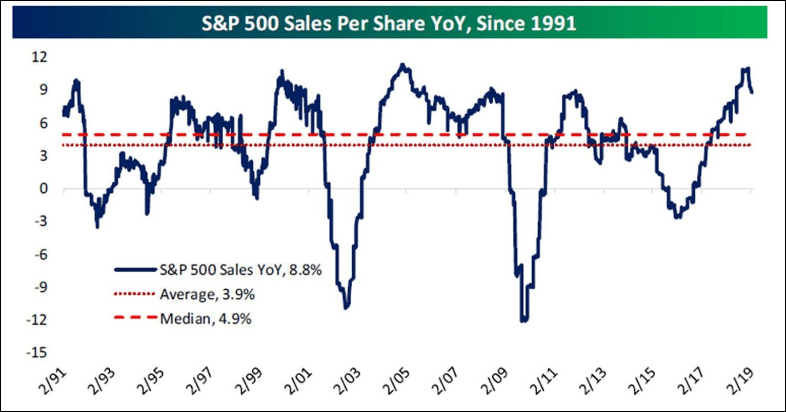 I have also opined that my work showed that the equity markets should trade higher into the mid-February “energy peak.” However, recently I have stated that, due to the extreme near-term overbought condition of the stock market, I do not “trust” the rally. Indeed, who do you trust? Plainly, I agree, believing the secular bull market has years left to run. Yet, a near-term pullback may just be in the cards given the overbought condition of the stock market and the aforementioned divergences. Surprisingly, however, my indicators continue to favor the upside despite the potential for the mid-February “energy peak.” This action is a pretty rare occurrence and is a head scratcher. Accordingly, this week’s market action will be an important “tell” about the short-term direction for stocks. 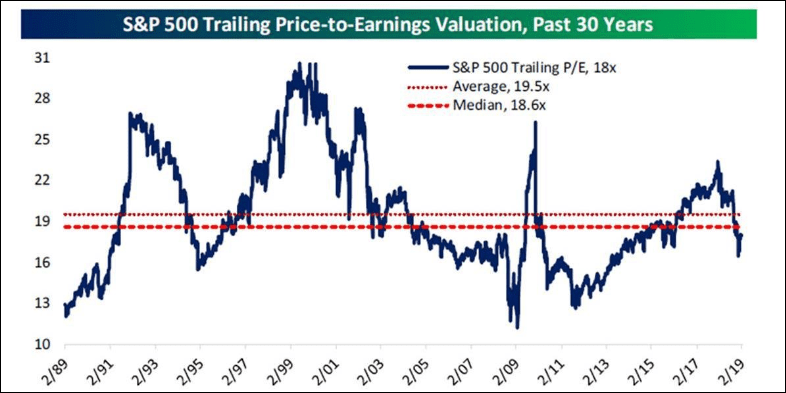 Speaking to valuations, the SPX now trades at a trailing P/E of 18x versus and average of 19.5x. We would note that, at the December lows, if the consensus earnings estimates are right, the SPX was trading at less than 14x forward earnings (chart 2, page 2). While the earning’s growth rate has likely peaked, EPS are still relatively decent. Indeed, so far in the 4Q18 earnings releases, 65.6% of reporting companies have beaten the estimates and 59.6% have better revenue estimates. As for sectors beat rate, Technology, Industrials, Communication Services, and Healthcare were the best (chart 3, page 3). Also, sales growth remains impressive and is rising at the fastest year-over-year clip since the data began to be collected (chart 4, page 3). 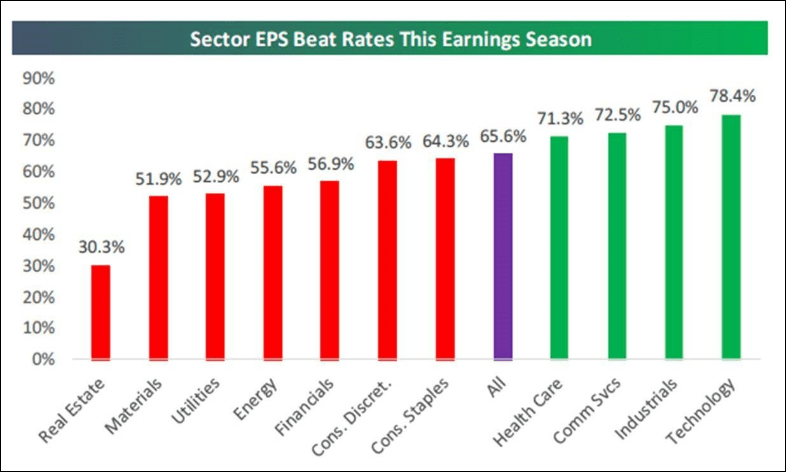 During every earnings season, we try to list a few companies that have beaten their earnings and revenue estimates, raised forward earnings guidance, have positive ratings from our fundamental analysts, and screen well by my indicators. Such names from this earnings season for your consideration include: Mix Telematics (MIXT/$17.33/Strong Buy), Estee Lauder (EL/$154.71/Outperform), Harris (HRS/$160.16/Outperform), Mohawk (MHK/$135.78/Outperform), and New Relic (NEWR/$103.21/Outperform). As for too far too fast, in our notes of some 55 years, that is just nonsense. This week is kiss and tell time as we enter the mid-February “energy peak” as the SPX stalled at its 200-DMA Maginot Line. Surprisingly, my indicators continue to favor the upside despite the “energy peak.” This morning, the preopening S&P 500 futures are better by 9 points as China is upbeat on trade talk news. The combination of critical China-US trade negotiations and expiry week makes for an extremely combustible stock market. Of course, the question is: In which direction? Headlines, rumors, and whispers about the trade negotiations should impact trading. It could be a wild week!